This series is to show you how the maxis-made sims in my game have been played. I would love to hear from you so feel free to let me know how they turned out in your game! This chapter is about Beau (Brandi Broke's second child) and his younger brother Skip Jr. Beau was a fantastic child. 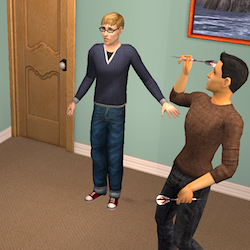 He was a neater sim than his brothers so was always helping out around the house. Brandi really appreciated this as it meant she could focus on raising his younger brother, Skip Jr, and also he career in Law Enforcement. It was her dream to reach the top. 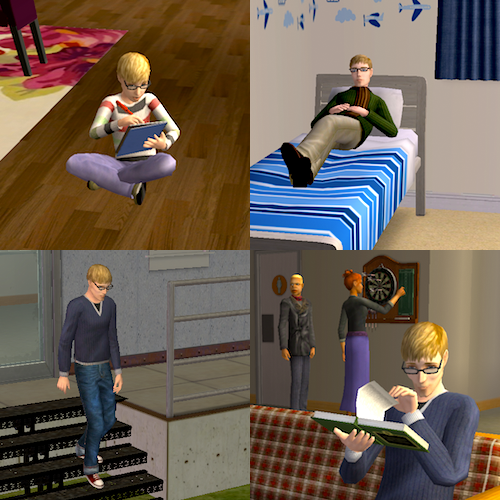 Beau also proved to be a very intelligent, knowledge-driven sim. He was eager to go to college and did so soon after his birthday. He wanted to go into the medicine career so studied biology. Brandi spent a lot of her time with Skip Jr, teaching him how to walk, talk and do his homework. She really wanted her children to do well and go further in life than she has. She struggled financially while the boys were growing up and didn't want them to deal with the same thing. Skip Jr grew up to be a family sim, like his mother. He couldn't wait to fall in love and start a family. He went to college to further his education in order to get a better job at the end of it. It was a good move because it was there he found the love of his life, Carla.